Mowing the lawn can be a time consuming job, especially if you have a large yard. By choosing a good lawnmower, you can save time and effort in keeping your yard neat and trimmed. There are many different options when it comes to lawnmowers. They come in the push mower style, battery powered or gas powered and self-propelled. The type you choose depends on your mowing preference as well as the size of your yard. If you have a small space to keep mowed you may want to purchase a small push mower as they require less storage space when not in use. Those with large yards will likely want a mower with a large deck. Owning your own mower means that you can do your yard work without having to hire someone else. This means saving money and allowing you to get the work done when you need it done without depending on a mowing service. Lawn mowers are available in a wide range of prices. The prices are determined by the brand name as well as the features of the mower. The following is a list of the top 10 best lawn mowers based on consumer report. The Great States 304-14 14″ 5-blade lawnmower has a classic push design that works well for mowing small yards. It has heat treated blades that are designed to stay sharp through many uses. The mower has a 14″ cutting width so that you can use it in narrow areas. This push mower from Great States allows you to adjust the height from 1″ 1 3/4″ for the lawn length you prefer. 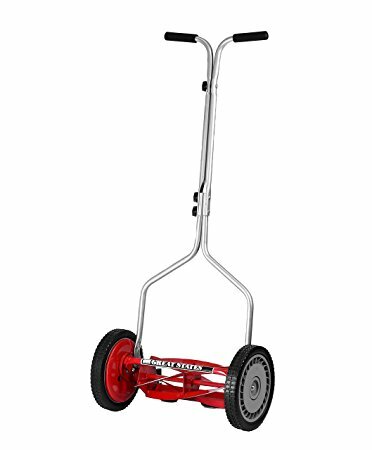 The unit is lightweight and has composite wheels so that it’s easy to maneuver around your yard. The mower is resistant to corrosion. The zinc plated handle has plastic grips for comfort while you’re mowing. The Troy-Bilt TB270ES is a self-propelled mower that makes taking care of your lawn easy. This mower is powered by a 159cc OHV engine. It has an push-button electric start for convenience. 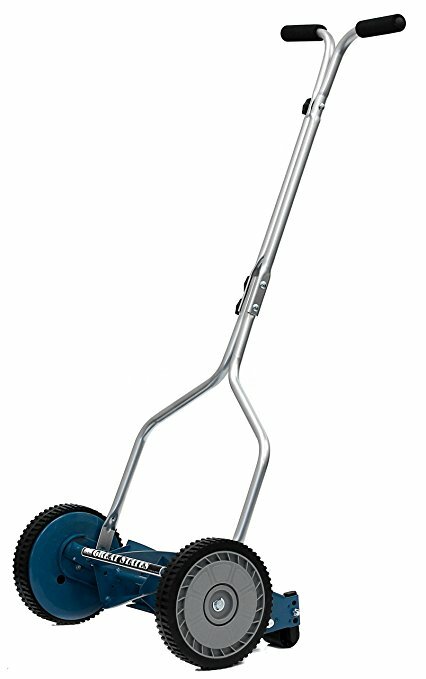 The mower has a durable 21″ steel deck that is designed to last. This lawn mower from Troy-Bilt is equipped with a traction cutting system that provides you with a clean and even cut every time. It has an adjustable loop handle so that you can easily operate the machine. This mower runs on gasoline and comes with a mulching bag so you can contain the mess if you don’t want to throw grass onto your lawn. 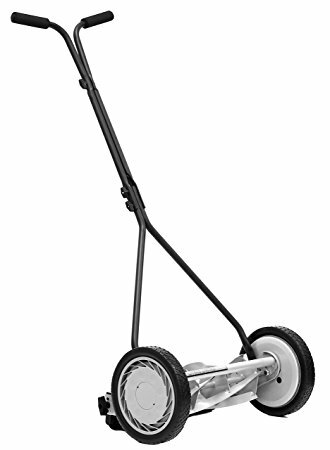 The Great States 204-14 hand reel lawn mower has a lightweight design that makes it easy to push around your lawn. This mower has high polymer wheels that are 8.5″ in diameter. The wheels have integral molded tread that provides traction while still allowing you to mow your lawn quickly and efficiently. This class push-style mower from Great States has an adjustable 3 section roller. You can adjust the height from 1/2″ to 1 1/2″ to get the look you want in your yard. The mower has a 14″ cutting area that works well in narrow spaces around gardens or other areas in your yard. It has steel side plates and a formed torsion tube for long-lasting durability. 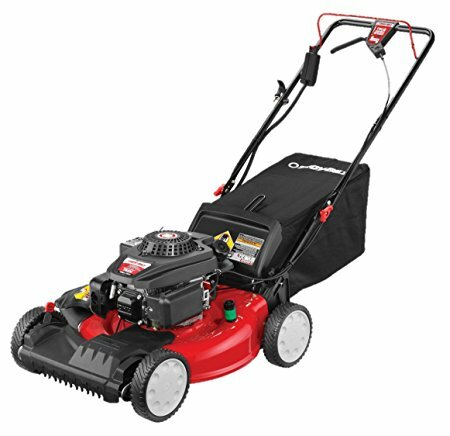 The American Lawn Mower 1204-14 has a 14″ cutting space that works well for small lawns. 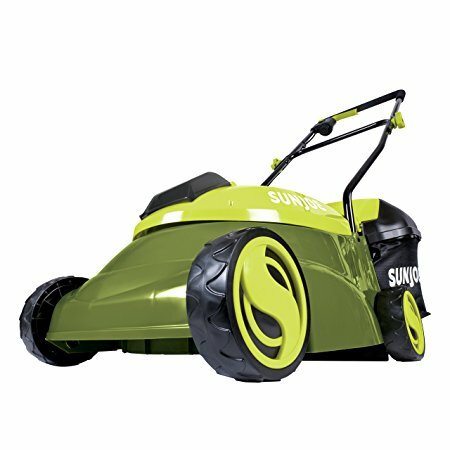 This push mower has a classic design that can be used to trim around gardens, flowers beds, or other narrow spaces. The has a 4-blade reel with blades that are designed to be sharp and precise, offering you plenty of cutting power for your space. This lawn mower from American Lawn Mower Company is lightweight and weighs only 19 pounds. It allows you to adjust the height from 1/2″ to 1 3/4″ to customize the look of your lawn. The mower has a rear grass deflection piece that helps keep you free of grass and debris while mowing. The Great States 415-16 Reel Mower has a 16″ cutting width which makes it perfect for small yards or for use around tight spaces on your lawn. This mower allows you to easily adjust the height from 1/2″ to 2 1/2″. 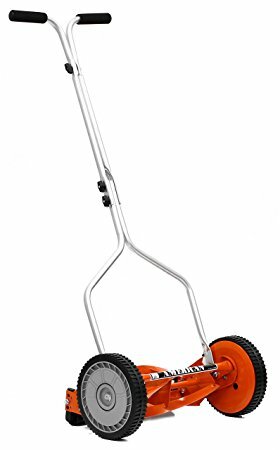 The unit has 10″ ball bearing wheels that turn easily but still offer plenty of traction so that you can get your yard mowed quickly. This reel mower from Great States is lightweight and easy to maneuver, even in tight spaces. It works well for those who want to mow their small yard in an eco-friendly manner. The mower has a powder coated finish that is designed to last and is resistant to rust. The BLACK+DECKER MTC220 3-in-1 trimmer, edger, and mower works to mow small spaces in your yard or detail tight areas where a standard mower can’t reach. This machine is cordless and has a lithium ion battery for long-lasting battery life. It’s designed to hold a charge for an extended period of time and comes with 2 batteries so you can keep mowing without worrying about a dead battery. 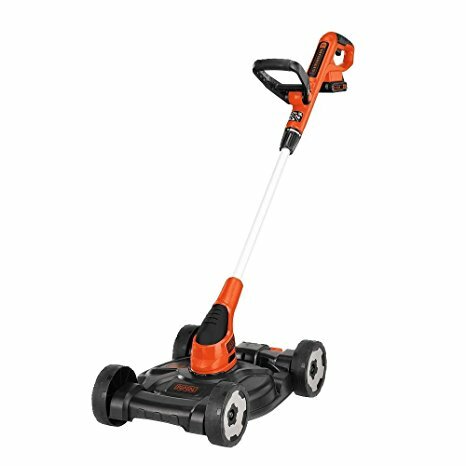 This mower from BLACK+DECKER has a pivoting handle that makes it easy to maneuver around your lawn. The adjustable deck allows you to cut your lawn at your desired height. The mower has an adjustable feed system that helps prevent bumping and stopping while you’re trying to mow. 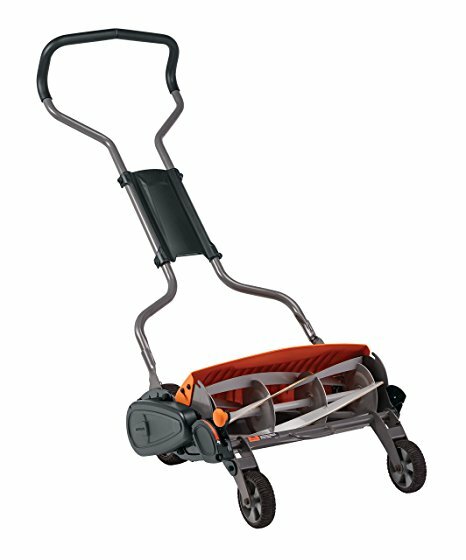 The Fiskars StaySharp Max Reel Mower is an eco-friendly mowing machine that has been designed to be around 60% easier to push than other similarly designed mowers. The machine has a reversible grass chute that can be positioned to push clippings forward away from your feet or downward and backward. This mower from Fiskars has durable blades that are designed to stay sharp throughout many uses. The mower has a unique design that allows the blades to extend over the entire width of the machine, giving you a full 18″ width of cutting power. The Sun Joe cordless push lawn mower is designed for use on small to medium size lawns. It has a built-in push button LED indicator that lets you know the battery level. The mower has a 3-position height adjustment so you can mow your lawn at the height you prefer. This mower from Sun Joe has a removable safety key to prevent accidental starts. It comes equipped with a 28 V rechargeable battery that has a long battery life and is able to hold a charge for a significant amount of time. This mower is ETL approved and it comes with a 2-year warranty from the manufacturer. 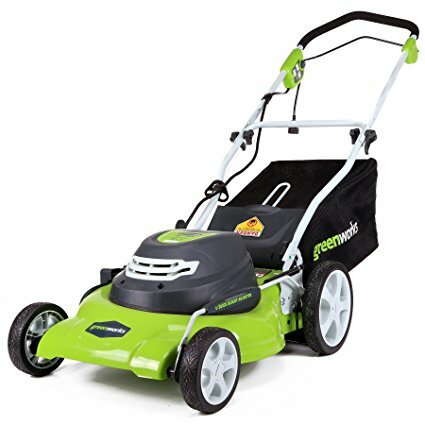 The Greenworks 20″ 40V Twin Force cordless lawn mower comes with a lithium ion battery system that includes 1 4AH battery and 1 2AH battery. The system also includes the battery charger. The mower has a 20″ cutting deck that works well in small to medium size yards. The mower is maneuverable and balanced so you can easily mow some tight spaces around the yard. 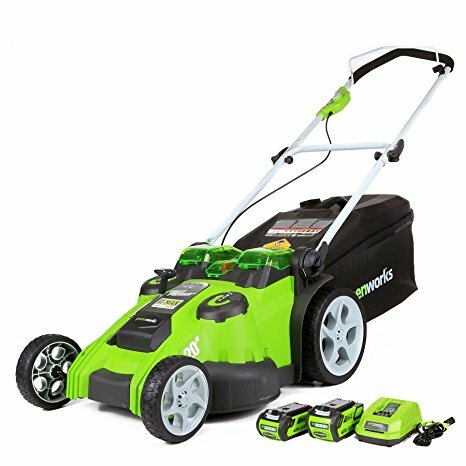 This mower from Greenworks has dual blades that work together to cut your lawn quickly and evenly. The mower includes innovative technology that allows the machine to adjust power or runtime based on the thickness of the grass you’re mowing. The Greenworks 20″ 12 amp corded lawn mower has a 20″ cutting deck that can help you cut small to medium size lawns with little time and effort. The mower has a 7-position height adjustment so that you can trim your lawn based on your ideal grass height. The powerful 12 amp motor helps to ensure you have all the power needed to complete your yard work. This mower comes with a mulching bag if you prefer to catch the grass clippings. It also has the option to eject the clippings to the side. The machine has a push-button start and manual drive which works well on mostly level yards. Choosing a lawn mower can depend on the size of your yard and the amount of time you want to spend on keeping it trimmed. If you have a small space or have a lot of narrow areas around your lawn with flower beds or other types of obstacles, you may want to choose a compact mower to ensure you can get into the small spaces. There are many different reel-style mowers that are environmentally friendly and can work well in yards that don’t have a lot of space. You may also wish to choose a reel mower if you want to save money on gas or don’t want to use electricity or batteries when mowing your lawn. If you have a medium size lawn, you may wish to purchase a mower with a wider deck. They come in corded, cordless, and gas-powered options. These mowers do most of the work for you and can greatly reduce the amount of time you have to spend on keeping the lawn mowed. If your yard isn’t level you may want to choose a self-propelled mower as these are able to pull themselves up hills with little effort on your part. It can be beneficial to read online consumer reviews when choosing a mower. These reviews provide information from others who have purchased and used the mower which can help you choose the best option for your money.